BSL 2. Bay Saint Louis, MS.
1660 SF, 3 bed, 2 bath. 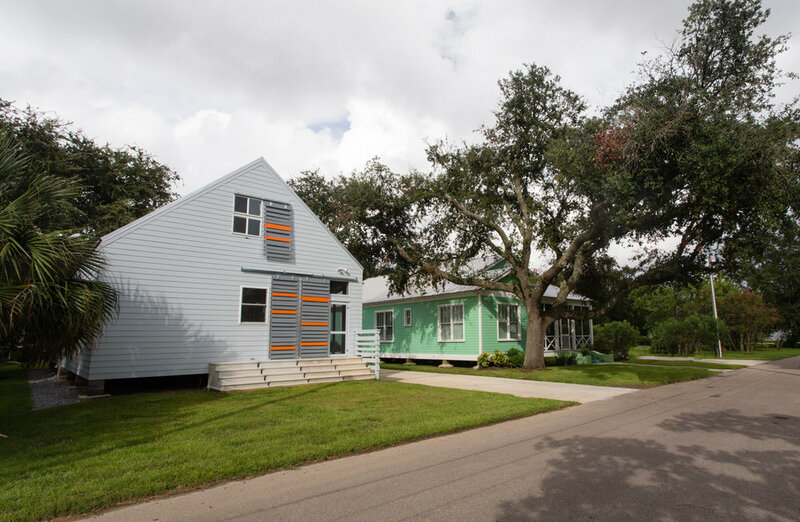 The BSL 2 House is a Gulf-side 2nd home in the historically designated area of Bay St. Louis. It is not only the client’s second home but it is the second design and second site for the house. The simple goals for the home are to create a small interior 3 bedroom 2 bath house, efficient in space and low on maintenance while maximizing the exterior spaces. 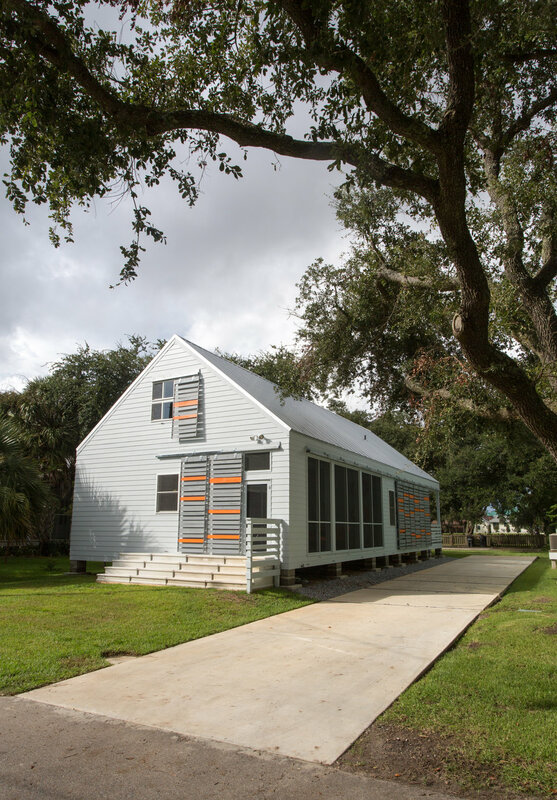 The more complicated goals include designing a house that can be open when occupied and closed when not as it is 300’ from the Gulf of Mexico and must be secure from storms. For anyone who lives in hurricane prone areas, “boarding up the house” is an important part of storm preparation as it not only protects the home but also the neighbor’s. The clients, who live just far enough away and along the major evacuation routes to make “boarding up” even more difficult than it already is, requested that the house could be boarded up as part of the design. 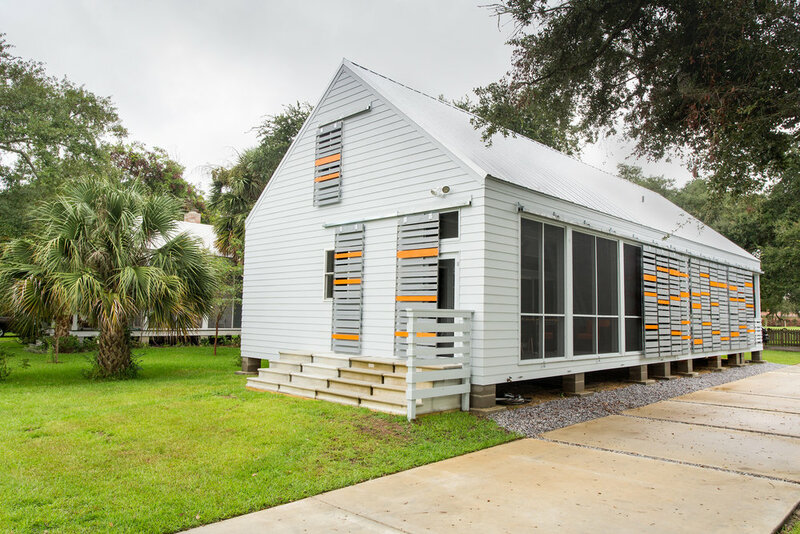 They did not want the off-the-shelf hurricane shutters, they wanted large pieces of glass, and they wanted the house to look inviting even when it was closed for a storm or when the owners were away. Couple these goals with the historic district requirements and the design challenge is set. The resolution then became how to shutter the house not only at the scale of the windows, but also the doors, the large porch, and the small porch. 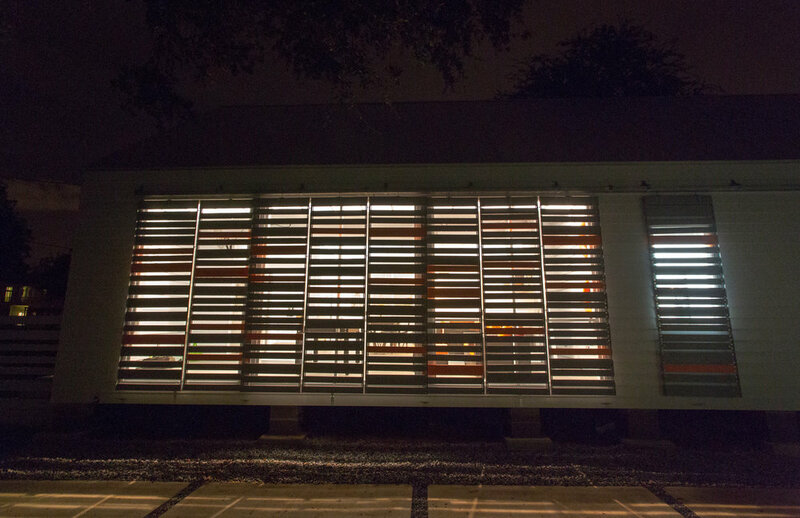 The exterior of the house is detailed with large, galvanized, barn sliding door hardware from which the shutters hang. The shutters that close the house are constructed at the scale of the openings they protect (which means some are as large as walls) and materially are composed of a galvanized metal frame, stainless steel hardware, and stained treated lumber. 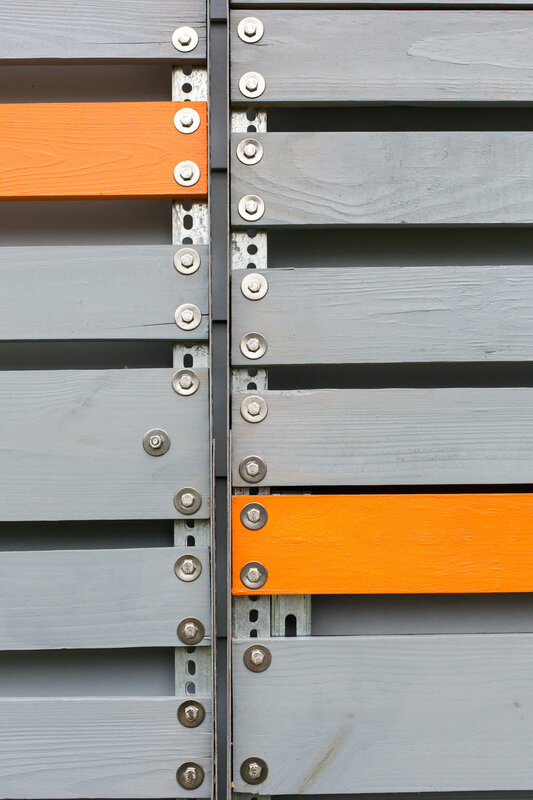 These materials not only allow for the stability needed for such large shutters but also handle the salt of the Gulf air and the winds of a Gulf storm. They also, because they slide in tracks that almost completely ring the house, allow the house to be constantly changed. It can be closed (for storm or absence), it can be partially open (to block the sun or create privacy) or completely open and slid out of the way. This flexibility captures all the characteristics of a true working shutter and also makes them a major design feature of the house. The interior of the house is designed to capture the exterior space of the porches and match the vacation living activities. The bedrooms are small and private and in a dark space for sleeping late as the owner likes to do when vacationing. The main living space connects to the main large porch as one continuous room through a series of sliding glass doors and large glass transoms. When open the exterior living and interior living become one, when closed they visually act as one. The kitchen, dining and living areas (interior and exterior) are all combined to facilitate family gatherings, game nights, feasts, and lying about. 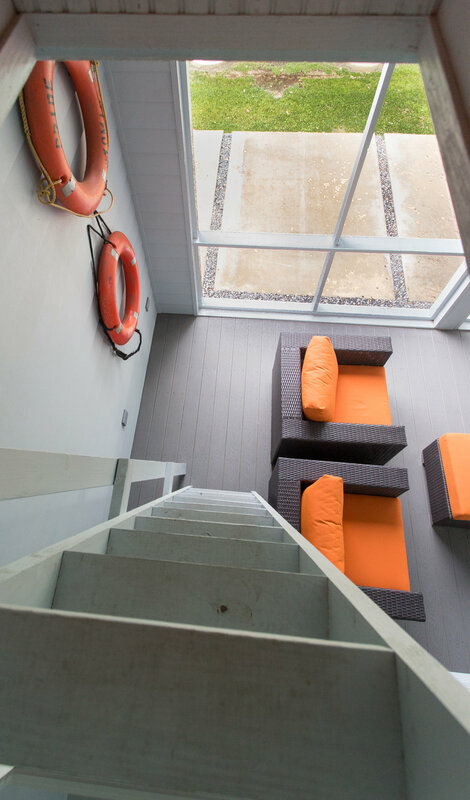 On the front porch, a fixed ladder provides access to the kid’s loft which runs from end to end, directly centered over the main floor. The 10’ by 10’ by 62’ loft space is constructed with box truss framing which not only provided for the loft, but also the open floor plan in the main living area and the exposed framing in the porch and living area ceilings. This unique ceiling feature works to join the inside and the outside and is accent lighted. Another feature of the loft framed in the truss is that it allows the children to look down over the rail wall to the exterior porch. 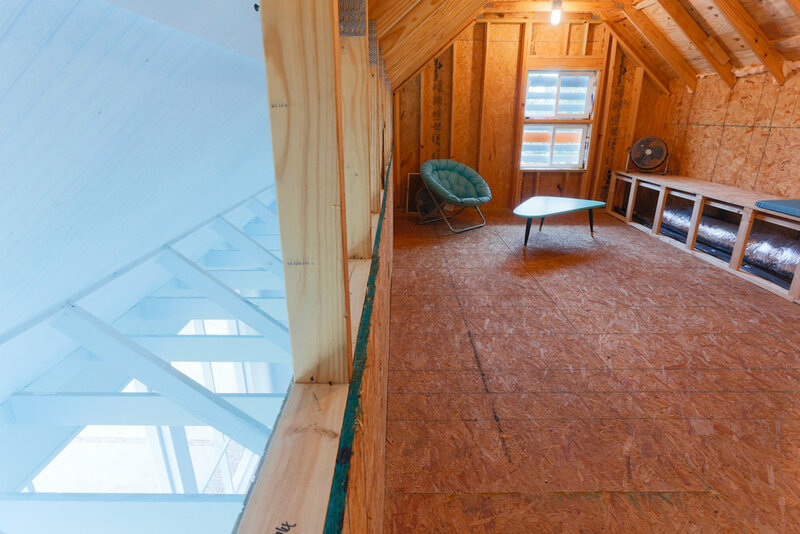 This design feature also helps circulate the air on the porch and throughout the loft by creating a draft flow from the porch floor up through the loft and out through the end wall windows. 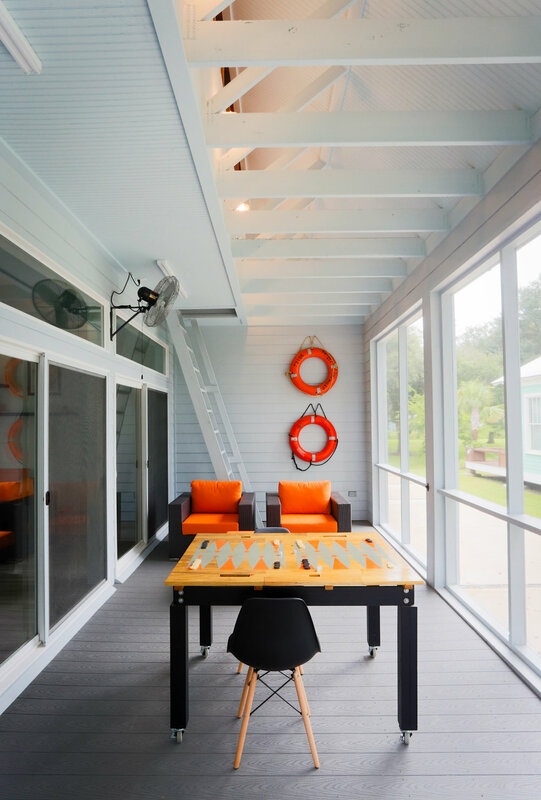 The rear porch is designed for the beach activities. It is the first space the owner meets when returning from a swim or kayak. Thusly it houses the outdoor shower, the beach stuff closet (hidden behind another more solid sliding wall,) the hooks and rails to hang wet towels, and of course the area to take off sandy footwear. As with the rest of the house, it can be closed off with shutters when the owner is away or a storm is coming.